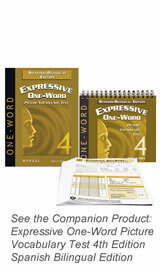 Now with expanded norms (ages 2-0 through 70+), this edition is intended for use with and was normed on a bilingual population of individuals who speak Spanish and English with varying levels of proficiency. Because examinees are permitted to respond in either language, the test measures total acquired vocabulary; it is not a test of language proficiency, since language includes grammar and syntax, as well as vocabulary. 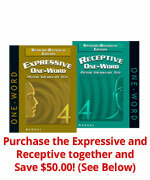 Norms are separate from the English 4th edition of the ROWPVT. The Spanish-bilingual edition (SBE) tests are co-normed, allowing for a comprehensive evaluation of a person's naming abilities. 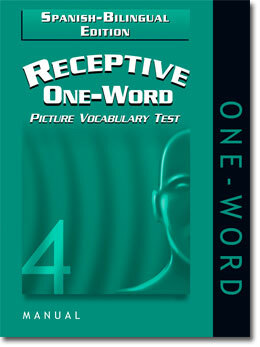 The Receptive One-Word Picture Vocabulary Test-4: Spanish-Bilingual Edition can be administered in either Spanish or English or both languages, and the individual is given the opportunity to respond in either language. 180 color plates are presented singly to the examinee, who is shown four images and asked to match a word that is heard to the object, action, or concept presented. As with the ROWPVT-4 (English version), the ROWPVT-4: SBE retains the use of prompts and cues (shown on the Record Form) to ensure that examinees will attend to relevant aspects of each illustration. Age-related starting points and ceilings (reached when the examinee makes a set number of consecutive errors) ensure that only a subset of items is administered, allowing testing to usually be completed in 20 to 25 minutes. Scoring is easy and straightforward, and generally takes about 5 minutes. Raw scores are reported as standard scores, percentile ranks, and (if necessary) age equivalents. 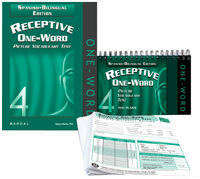 IMPORTANT: Test components of the Receptive Spanish-Bilingual 4th Edition are not interchangeable with components of the Receptive English 4th Edition (2011). SPECIAL OFFER: Save $50 when purchasing EOWPVT-4:SBE and ROWPVT-4:SBE test kits. See Special Offers below.